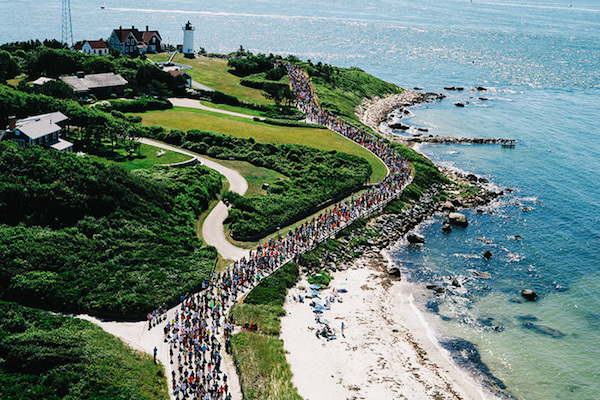 The Falmouth Road Race, sponsored (currently) by New Balance, is one the premier distance races in the country, attracting elite runners and some 11,000 back of the backers. It’s a fixture on the Cape’s summer calendar, usually occurring the third Sunday in August. The course is one of the prettiest road running options on the Cape, with wide ocean views for more than half of the 7 mile one-way route. We’ve attached the official course of the race and description. The race is seven miles long and begins in front of the Woods Hole Community Center, near the drawbridge on Water Street. The first three miles are narrow, hilly, winding tree-shaded roads, while the last four miles are open on the flat right next to Martha’s Vineyard Sound. A small steep hill lets you know that you are beginning the last half-mile of the race. Once you crest the hill it is “all downhill” to the finish. For a shorter option, focus on the sections along the water, which is the last four miles of the race. There are permanent mile markers along the whole course. For more specific, turn-by-turn directions, go to the course info web site. There is also some very nice waterside running east of Falmouth Heights Beach, about 3 miles along Grand Ave. and Menauhant Ave., to Central Ave. See our ‘Falmouth Waterside’ route. Route Map Route Map: Grand Ave. & Menauhant Ave.